No matter how much you beg, I won’t tell you where I found them. I won’t even direct you to the state where the ramps were growing. Ramps colonies are top secret. This recently trendy delicacy, which may be described as wild leek, is not always easy to find. You can make ramp tarts, ramp grits, fried ramps, or ramps & eggs. They can be roasted sautéed, pickled, or puréed. They can be put raw in salads or stir fried. Ramps, officially allium trioccum, are part of the lily family, which includes garlic, leeks, and onions. Slightly resembling scallions, they have a white bulb at the bottom, and below that are the roots. And they are among the first greens available in spring. No matter where you live in the US, ramps may be growing wild. They’ve been around for a long time in the east, from Canada to Georgia. Until the 1980s, though, ramps were not part of northeastern restaurant culture. The buzz began in food writing circles, and in 1983, a recipe for a ramp tart and cheddar-enriched ramps grits soufflé appeared in Gourmet magazine. Now, the spring bulb is threatened with overharvesting. Lawrence Davis-Hollander, an ethnobotanist who lives in the Berkshires, sees a problem so serious he put out a “Ramp Action Alert.” Quebec banned ramp harvesting in 1995 and the Great Smoky Mountains National Park banned harvesting in 2004. The problem is that overharvesting will reduce sustainability of ramps as well as their ability to reproduce. Even harvesting 25 percent could require 10 years to recover. In 2011, Davis-Hollander estimated over 2 million ramps plants were harvested for culinary purposes. Wild food specialist Russ Cohen, who also lives in the Berkshires, has noticed whole patches being decimated. He also noticed that when ramp colonies are disturbed, the areas are susceptible to invasive species. Apparently, it’s not hard to wipe out an entire plant species, even one as common as ramps. According to Davis-Hollander, ginseng once was just as common as ramps are now. Yet it’s now virtually extinct from many woods, and generally scarce. Ramps lovers who don’t want to give up the habit can follow some simple rules from Davis-Hollander: don’t take more than a fifth of the leaves and don’t dig out the bulbs. Also, enjoy ramps you find in woods, but don’t buy them commercially. In other words, everything in moderation. About the author: Amy Miller is a writer who works in the public affairs office of EPA New England in Boston. She lives in Maine with her husband, two children, eight chickens, chicken-eating dog and a great community. As my family drove our rental car along the unfamiliar Florida highways, I looked out the window. When we arrived where we staying, I got out of the car. I stood still and the animals popped out. It revealed to me that you have to slow down to truly see nature at it’s fullest. You see more of nature in the middle of a hiking trail, standing still, than driving by. What really struck me when I got out of the car was the sheer diversity of the plants and animals surrounding me. In the marina behind our rental house, there were pelicans, cormorants, anoles and so much more. It was not only the diversity of animals but also the diversity of plants that amazed me. I saw everything from coconut trees to mangroves (and in the rental next to us they even had a cactus). Filled with this wonder of the nature surrounding me, I slept that night with my dreams filled with amazing plants and animals. The next morning my parents woke me up and we went out to an island. As we sped our boat out to the island, I looked in the water and I saw nothing. As I looked at the island from a distance, I saw no living animals. But as soon as I got off our boat and slowed down, it was like my vision had changed. There were pelicans in the mangroves and anoles climbing around and little Sergeant Major fish swimming around the shallows of our island. I learned from my trip to Florida that to enjoy something to its fullest, you have to slow down. Just like eating chocolate bars, you slow down to get the deep flavors. The turtles have problems because a large part of a turtle’s diet is jelly fish. A turtle can very easily mistake a plastic bag for a jelly fish and eat the bag and then have stomach problems and possibly die. Cormorants are a small, one-and-a-half-foot tall bird (only slightly larger that a duck) . It waddles along road in search of food. A hungry cormorant is a determined one. If it spots a fish in a pond across the road, the cormorant will waddle across the road only to be hit by a car. Since cormorants are so short, drivers can’t see them and accidentally hit them. I learned a lot about what I know about cormorants from Kelly Grinter, founder of the Marathon Wild Bird Center. Gulls are a nuisance to fisherman because they eat the bait off of their fishing poles. Some fishermen get mad and throw rocks at the gulls. The stone could cause serious damage. Gulls also swallow hooks and fishing line from fishing poles when they steal the fish. But there are people and organizations out there that are working to help these poor injured animals. The Marathon Turtle Hospital is located on Marathon Key in Florida. They work to help turtles that have been injured in the wild. They have an operating room, a physical therapy room and even a lab. They save over a hundred turtles every year. Not content with just saving turtles, they also give lots of educational programs to help people understand how to protect turtles. It’s not just turtles that people are working to help. The Marathon Wild Bird Center is working to help heal injured birds. Kelly Grinter and her volunteer staff are constantly working to help get these injured birds back into the wild. But you can also help make life a safer place for these animals! Just doing simple things like picking up trash and using reusable water bottles can save an amazing animal’s life. If you are a fisherman, and you have broken fishing line, be sure to dispose of the line properly so it does not end up in the water. If we all work together we can create a safe haven for the amazing creatures of the Florida Keys and animals everywhere! Liam is eleven years old and lives in Wisconsin. He likes to read books and go on adventures with his friends. He also likes to have fun with his family. Liam enjoys exploring nature, writing about it and, most of all, helping protect it. As I look back at my relationship with my Mom over the years, I’ve come to the conclusion that I’ve become an environmentalist largely due to the values that she instilled in me as a child. The love of nature, the interest in protecting wildlife, especially birds, the appreciation for flowering plants are some of the things that my mother taught me, not only in words, but through her actions. As far as I can remember, we always had flowering plants in the garden and indoor house plants as well. For many years, my mother had birdfeeders in our back yard. Given the fact that we lived in Puerto Rico where we enjoy summer-like weather all year round, our home definitely felt like a tropical oasis. As I’ve mentioned in earlier blog posts, my parents, both my grandmothers, and even great grandmother, were fortunate to have a green thumb. It seemed that anything they planted bloomed easily and flourished. I’ve tried to replicate their gardening skills at home as best as possible. I like to joke that our family’s green thumb seems to have skipped a generation in my case. Nonetheless, I still try to create a welcoming natural environment around my home and a green environment indoors as well. So as we get ready to celebrate Mother’s Day, I would like to thank my Mother for what she has taught me. I hope that I will transmit those teachings to my children so they will also appreciate nature and protect the environment. This Mother’s Day, as we have done during similar celebrations, we’ll probably go to Brookside Gardens. I promise I’ll take pictures. Do you have any special plans for Mother’s Day? We would love to hear from you. Spring is on its way, and of course that means lots of planting; so I’d like to share some ideas with you on planting in your own community. Planting flowers, bushes, trees, and vegetables can be very beneficial for you. For instance, at my school, we are working on planting flowers in the shape of our school logo, SH. It’s an easy way to show school spirit in a eco-friendly way. You could even be a little more creative by using flowers with your school colors. But the planting doesn’t have to stop there- having vegetable gardens is another excellent idea for a home or school. Where I go to school we have a special day each year where we harvest our vegetables and eat them for lunch. The vegetables we usually plant are tomatoes, lettuce, and basil. In the past we’ve planted pumpkins as well. By doing this in your home, you can save money when buying groceries, and have fresh food whenever you like. So use your green thumb this spring and plant something in your town! Jayne is a Junior High student in Sleepy Hollow, NY and has an interest in environmental protection. She is a proud member of the Environmental Action Club at her school. “Be very quiet, Heidi, and we might see some animals this morning.” These are the words my father would tell me as he walked my older sister, Katie, and me to school. Our local elementary school, Oscar Henry Anderson (OHA) Elementary School in Mahtomedi, Minnesota is surrounded by eleven acres of woods and prairie. Spending time in the woods with my father and sister are some of my best memories of elementary school. On our morning walks we would find as many different plant species as we could and have contests to see who could pick out which bird was making each call. Things were constantly changing in the forest, and every day there would be something new to find. I want everyone to experience these things, this is what I had in mind when my dad, sister, and friends Andrew, Cole, Brennan and Davis, and I decided to create a nature playground for the children of OHA. We pulled gooseberry bushes, buck thorn, and barbed wire out of the area and constructed a natural barrier. We moved some logs that had been cut and pulled using the old style horse method into the area for the kids to play on. I recently went back to OHA to ask the kids what they think about their new natural playground, called The Outback. I sat down with Devon, who told me he likes going out there and building things. I then talked to Johnny and Josh and asked them what their favorite place was, and Josh immediately answered that there is a tree stump that makes a perfect bench. I also chatted with Hailey, Eva, Alicia, and Zoe, and they all said that it was their favorite part of school. They told me the best part about The Outback is that everyone works together as a team and there is no fighting. They are accepting of each other and everyone is allowed to play. I think it is incredible that these kids are able to come together as one and have a good time. The Outback is surrounded by a barrier of buckthorn and other branches so kids can’t wander off. It is near the school, yet secluded enough that the kids feel free. Overall the Outback teaches kids about the plants and animals that live near us and how to take care of the woods. It inspires innovation and fosters creativity. Heidi is a sophomore at Mahtomedi High School, Mahtomedi, MN, where she participates in cross country running, Nordic skiing, track, band and Eco Club. She enjoys being outside, especially fishing and hunting with her family and friends. The recent Philadelphia Flower Show inspired me. I bought 3 kinds of asparagus roots and seed packets for those sweet, round yellow watermelons that are hard to find, corn and green beans. Already in my garden are blueberry bushes and a sour cherry tree. I have found that growing my own food is fun, relaxing and educational. Here are some of the lessons my garden has taught me. Conditions need to be right or your seeds won’t grow and your plants won’t thrive. If a plant needs to be in the sun, plant it in a sunny area. If a plant needs moist soil, keep it moist or it and you will not be happy. Create a healthy garden environment and wildlife will come. Birds love berries, even when they are not ripe. Bunnies love small tender plants. Deer? If they are in your area they will probably find you, as will slugs and beetles and on and on. It means your garden is healthy and inviting. Nothing tastes like fruit and vegetables you grow yourself. They are typically way better than what you can find in stores. Ah, there’s nothing like eating a warm tomato that you just picked! Plus, you can plant unusual varieties, like heirlooms, to experience tastes you didn’t know exist. Biodiversity is a very good and yummy thing. Using water you’ve captured (like in a rain barrel) is a better way to water your plants, particularly if your tap water is chlorinated. You might even just run a hose from a downspout into your garden. And, capturing stormwater can help reduce flooding from run-off. And, you’ll save money! Mosquitoes love to breed in standing water, so don’t have any. Turn buckets upside down. Getting attacked by mosquitoes while you are gardening is very annoying and they can spread disease. Weeds almost always grow better and faster than planted plants. That’s why they’re called weeds. Native plants grow better than non-natives. That is unless you are unlucky enough to have a non-native plant that’s invasive, like kudzu. Natives can be hard to find, but search them out — they are worth it. Don’t trash your yard waste; turn it into compost instead. Recycle! Reuse! Your plants will grow better with compost. Yes, I’m ready to get going outside in this earlier-than-normal spring in the Northeast. About the author: Nancy Grundahl has worked for the Philadelphia office of EPA since the mid-80’s. She currently works in Program Support for the Water Protection Division. Nancy believes in looking at environmental problems in a holistic, multi-media way and is a strong advocate of preventing pollution instead of dealing with it after it has been created. On my own land, I move things about willy nilly. If I need a pine tree for Christmas, I cut one. If I want a blueberry bush closer to my house, I transplant it. I love that. So I was hot to trot one morning to move a lush patch of moss carpet for a moss garden-in-a-pot. Not so fast, said my Finnish neighbor and dog walking partner. Moss is not to be taken lightly. It takes years to grow one little itsy bitsy handkerchief of moss, she said. Really? Really. Everyone in Finland knows this. OK, I said. And walked on dejected. I can’t even move moss on my own land? And yet my fantasy in moss lingered. So I checked around. I couldn’t find out how long moss takes to form (anyone know?) but I did learn it transplants easily. And that some people consider it a nuisance, although the Japanese use moss to add a sense of calm, age and stillness to a garden. I already knew moss grows in wet, shaded areas. But I also learned that although moss thrives in moisture, its leaves can withstand drought for quite some time. Also, I learned that moss patches are made up of thousands of little plants bunched together. They come from spores, and create thin branches that dig into the ground and replace roots. But they get their nutrients from the air, not soil, which is why they can grow on rocks (and aren’t thrilled with compost). The four requirements for moss are acidic soil, shading, moisture and humidity. They like soil between about 5 and 6 on the pH scale. Many nurseries don’t carry moss so it may be best to get it from a garden – yours or your neighbors (with permission of course). Moss is happy if you also transplant the soil or wood under it. If you are trying to put moss on rock, recipes for success involve a blender, buttermilk, water, sometimes yogurt and always a brush. Truth be told, I couldn’t find much information on moss formation in the wild. One site said it takes about 18 months for moss to fully form, but once established, it can keep growing for a long, though undetermined amount of time. With no big warnings in site, I am going back up my hill. I hope the Finns will forgive me. Recently, Girl Scout Cadette Troop# 10717 from Florida uncovered an amazing fact during their Breathe Journey stage–a step they take to connect and take action to earn three leadership awards and engage in improving the world’s air quality. They toured a local waste management facility and discovered how energy is generated by using everyday trash. With safety gear and hard hats on, the girls took a close look at the process. Over 2,000 tons of municipal wastes arrive daily to the plant for processing. The trash is placed into a furnace to be burned and turned into high pressure steam. The steam is converted into electricity, which is sold to local utilities. Any ferrous metals that remain, such as iron and steel, are separated for recycling as scrap metals. The overall volume of incoming trash is reduced by more than 90% in this process. This is so much better than going into a landfill! For Troop # 10717, the next step to complete their breath journey involved creating awareness within their community. The “Greening with Greenery” project was created, which entailed each girl growing plants from seed to give away at a local event. In over 3 months, the troop had over 1,000 plants to give to their community! To be even more sustainable, the plants were given out in biodegradable newspaper pots instead of plastic ones. At the event, the troop educated the community on the harmful effects of air pollution and how plants can improve air quality. The project was a success! Not only will they receive their badges for the Breathe Journey but they’ve been asked to run their plant give-away booth at annual fundraiser in January. WAY TO GO! Yvonne Gonzalez is a SCEP intern with the Air and Radiation Division in Region 5. She is currently pursuing a dual graduate degree at DePaul University. A couple of years ago I gave my Dad grow lights for Father’s Day. He had mentioned to me that he wanted a garden, but living in a gated community there was not the appropriate amount of space on his property to do so. He started to create an indoor garden comprised of herbs and vegetables. It has been two years now and the small garden that started in the corner of his kitchen has now overtaken the entire kitchen and living room. I love to go over to my Dad’s to eat his homemade cooking made from vegetables and fruits straight from his indoor garden. As more people are becoming concerned about the use of pesticides on the fruits and vegetables we buy at the grocery store, organic produce has been increasing in selection. However, organic produce is usually more expensive and the energy it takes to ship the produce increases carbon emissions. 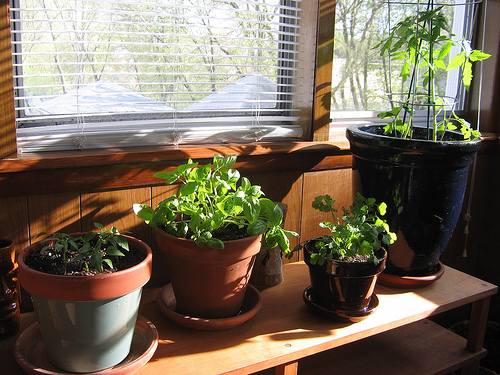 In-home gardening can be a way to divert away from pesticides while being fiscally and environmentally responsible. Although the grow lights, seeds, dirt, and pots will be relatively pricey at first, the results of your garden will pay off in just a matter of a few years. Starting an indoor garden can prove to be an excellent solution to those living in the city who do not have the adequate amount of space outside to make a garden. However, if you do have a large yard and enough space for a garden outside, having an indoor garden can be beneficial to those who would like to enjoy fresh, organic fruits, vegetables and herbs year-round. No matter the size of your house you can still enjoy the pleasures of a garden as plants can be placed almost anywhere in a house while adding to the aesthetically pleasing aspect of the newly acquired greenery. If considering starting your own indoor garden it is important to remember that it takes time to maintain a garden. You must remember to re-pot, water, and rotate your plants appropriately. Is it really taking time out of your day though? If you don’t have an indoor garden you must still go to the store, and pick out the produce that you want. It sounds a lot easier to simply just water the plants and then pick them when they are ready to eat. What do you grow in your indoor garden?